Carly Hennessy. Sunday Mail. April 26, 2015. p 54. Photo by Annette Dew. 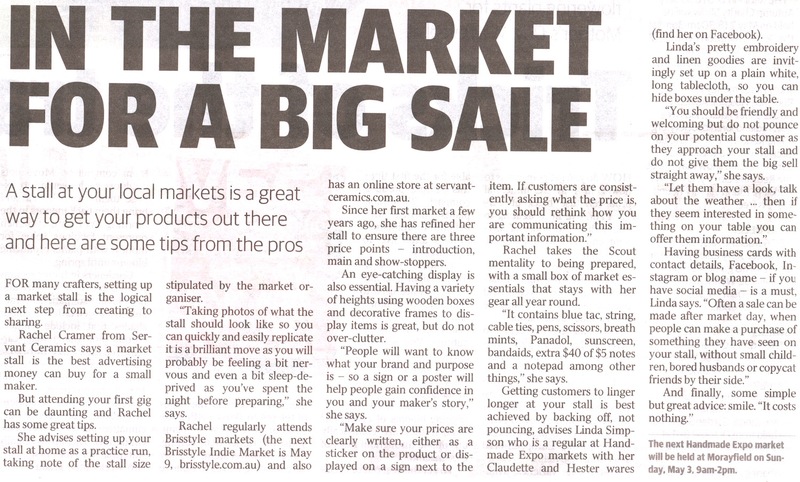 Thanks so much Carly, Annette and the Sunday Mail for asking me to contribute to this article about setting a market stall for the first time. What a wonderful write up! If you can cast your mind back to your first few markets – what were your rookie mistakes? What would you recommend/the essentials for a first-timer? I highly recommend doing a practice setup at home (taking note of the stall dimensions and sticking to them). Taking photos of what the stall should look like so you can quickly and easily replicate it is a brilliant move as you will probably be feeling a bit nervous and even a bit sleep deprived as you’ve spent the night before preparing.For your first market, get there as early as you can. You’ll need to introduce yourself, find your stall location and it will probably take a bit longer to setup than you expect. As beautiful and unique as your product is, don’t forget to display well! Using a floor length tablecloth to cover your table will help you to hide your boxes/containers from view. Having a variety of heights will help create interest in your general display and take care not to overstock your display, creating a sense of clutter. It always good to have backup stock that you can show people if they ask about a different colour/style. Woven mats, wooden boxes, decorative frames to emphasis key products is always an excellent way promote your most popular items. People will want to know what your brand and purpose is – so a sign or a poster will help people gain confidence in you and your maker’s story. Customers will ask for business cards so make sure you have something that they can take away with them. Include your online presences (website, facebook, instagram, etsy store) if you have them. In my experience, customers see your product, they choose to interact with you, they then evaluate you and your product and finally they’ll purchase from you. For some customers, this is happens all at once, in that first meeting. For others, they purchase during their second market encounter with you or they choose to purchase online a couple months down the track. Make sure your prices are clearly written, either as a sticker on the product or displayed on a sign next to the item. If customers are consistently asking what the price is, you should rethink how you are communicating this important information. It’s a good idea to vary your price points. Consider three levels – introduction, main and show-stoppers. Your introduction items are generally smaller, entry-level items that draw customers in. The main price points, while affordable, would generally be your most popular selling items. Show-stoppers are those items that catch everyone’s eye and that everyone wants to be taking home with them. They are usually at the higher end of the pricing scale. Also, you can never have too many payment options! While market-goers generally come prepared with cash, many stall-holders cater for larger purchases through mobile eftpos, alternate card readers and various apps which process credit sales with a smart mobile device. I use and recommend Pay Pal Here; it’s been invaluable for me. At my last market, PayPal sales accounted for 65% of purchases. That being said, you have to have an appropriate cash float too. Most people will come armed with $50 notes and depending on your price points, you will need to have enough change to swap the golden bills all day long. Your float will reflect your unique price points. There’s no real need to stock coins if your prices are in increments of 5! One of the best tips I received was to stock your float with $20 and $5 notes as well as $1 coins. People will often give you $10 notes so these will build up during the market as will the coins. A lot of fellow stall-holders wear their floats to keep them secure – ye old bumbag, shoulder purse or even an apron with a deep front pocket are all suitable options. So someone wants to buy one of your items? *fistpump* And you are successfully able to take their payment! *double fistpump* But how do you pack it? Having suitable bags, tissue paper, bubble wrap or even small boxes is seen as an extension of your customer service. Don’t overlook this important element. You must consider the sizes, colours and appropriateness of your bags. For cards or prints, simple paper bags, sealed with washi tape or a sticker works well. Jewellery is better protected in a small bag or paper box while ceramics usually requires bubble wrap. Don’t assume that your customer will have another bag to put the purchase in either. Also, for your very first market, your family and friends and their friends will usually be your biggest champions and promoters. If you can, ask them to spread out their visits throughout the market so that your stall isn’t completely overwhelmed for the first hour and other customers can’t get a nose in to see your amazing pieces. By spreading out their visits, they create a more natural atmosphere around your stall. Make sure you chose your first market event wisely. 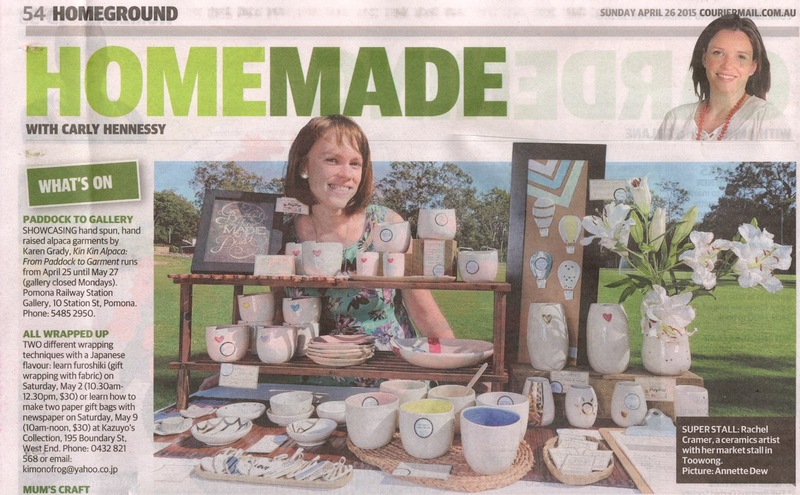 I started out with the Love Handmade and BrisStyle Markets as I loved attending these markets as a customer. They are well advertised and have a great focus and love of all things handmade. Yearly school fetes and larger community events can be excellent as they have lower stall fees but they don’t always have the ideal target market. Is there anything you can’t do without on your market stall? A sense of humour! Some days everything is against you – weather, traffic, you leave a box of goods at home and you can even forget your float! Customers will extend you grace once they witness your passion and amazing products and trust me, your fellow stall holders go above and beyond to help you out. There’s no guarantee that you’ll be able to sneak off to purchase food/coffee during the market so it’s best to have a contingency. Personally, I always have a 1.5L water bottle with me as well as some crackers, dried fruit and peanut m&m’s – protein and chocolate in the one bite! Having bite sized food is best as customers are always popping by and you’ll want to engage with them. Since using my point-of-sale organiser (aka: $4 accessories hanger with plastic pockets), I don’t know how I coped without it! It holds all the little things I need when wrapping up my items post sale. Hanging behind the stall, off the display stand, it has saves so much space and helps me to wrap the purchases quickly and efficiently. For really big markets or events, I also ask someone to help me with the packaging side of things. I also have a small box of market essentials that stays with my market gear all year round. It contains blue tac, string, cable ties, pens, scissors, breath mints, , sunscreen, band-aids, extra $40 of $5 notes and a notepad among other things. While you might not need these things, your fellow stall-holders, even your customers might need something and it’s best to be prepared! I’m assuming the camaraderie between stallholders is lots of fun. In what ways is that support/networking good? Fellow stallholders have a wealth of experience and information. Having a group of other stall-holders you can talk shop with, celebrate with and when the occasion calls for it, commiserate with, is essential and invaluable. The encouragement, advice, trade secrets, cross-promotion and “shake it off-ness” I’ve received from other stall-holders is something I truly treasure and do my best to pass forward when I meet a new marketeer. I also love the opportunity to collaborate and design new items with other stall-holders. In what ways does a market stall help your business grow? I see my market stall as a major advertising avenue. Attending markets has widened both my customer base as well as my retailer base and introduced my work to people who never would of seen it online. Markets provide a unique, authentic interaction between maker and user/purchaser. I love meeting people at markets who have received a Servant Ceramics item as a present. These customers usually end up buying another item as a gift for someone else and the circle of connection grows. The majority of my custom orders come through markets as they see the opportunity to personalise and create something unique for a loved one. There are so many other tips and tricks other marketeers can offer you – different things will work for different products! I hope some of these thoughts have been helpful! With a really big smile, Rachel.